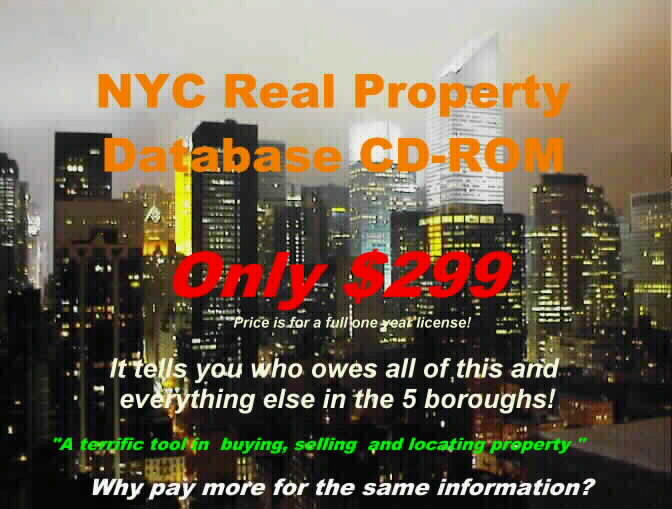 Coming Soon: A photo of every property in NYC on CD-ROM! Register! CLICK HERE to register to have your company listed on this site. Basic listings are free. Midway Locksmith 25 East 36 Street and Madison Avenue. The locksmith for the real estate industry. Doors, locks installed of all types. Commercial accounts our specialty. Serving the real estate industry fron the same location for over 30 years. Prompt service. 24/7 service available. Tel: (212) 576-1100. Re-filled Printer and Toner Cartridges 25 East 36 Street and Madison Avenue (ground floor). Tel: (212) 576-1100. Landlord Direct Rentals-Manhattan Online directory of Manhattan Landlord and Management companies. New York Press Real Estate Search New York Press, Online real estate classifieds. www.Design1.org Web design for the New York, New Jersey and Connecticut Real Estate industry. Klara Madlin Real Estate, Inc. Brokerage Web Design: . Real Estate Websites designed to sell or rent property. if it does not sell". George & Sons Comfort, Inc.
Grotto, J. & Associates, Inc.
Newmark & Co. Real Estate, Inc.
Do you need a high quality photograph of your building? We probably already have one on file. Send us an email with the address and we will tell you what we have available. The Real Estate Journal was founded in the early 1960's and has emerged as one of the leading current real estate business information sources for developers. They have several editions covering different areas of the north east.